Best PCIe RAID Controller Cards 2016-2017 – If you’re looking to expand the capabilities of your computer, RAID is a very powerful platform that can be utilized. There are three main benefits to using a RAID system. First, you’ll be able to add and maintain more storage space. Second, you can improve the performance of your hard drives or solid state disks well beyond what’s possible with a single disk system. Lastly, RAID can be configured to duplicate all of your data, so even if one of your drives fail you will not lose a single bit of data. There are a few ways that PCIe RAID controller cards can be configured. Which PCIe RAID Controller Card is Right for Me? This is the simplest way to use a RAID controller card. In SATA mode, none of the raid features are active. The card will simply give you some extra ports to plug your hard drives into. This mode is known as striping. It is used to increase the speed of your drives. Imagine you have a 1TB hard drive which can read data at a speed of 100Mbps. In RAID 0 mode, you will take two identical hard drives and spread the data across them. On your computer, it will look like you just have a single 2TB drive. But with RAID 0, when you load a file both of your drives are sending data at 100Mbps each, making your total transfer speed 200Mbps. This is known as the mirroring mode. The disks are configured the same as before, with two identical drives joined as one. This time, instead of spreading data across the two drives, the data is exactly the same on each one. The 2TB of storage you have in your computer will only show up as 1TB, but you are protected from data loss if a drive fails. When one breaks, the data is simply read off the other disk. You won’t have even a single day of downtime. This is a combination of the two modes above. You take four identical drives and install them. Two of the drives have the data spread out between them, while the other two duplicates the information on the first two drives. This gives you both the incredible performance of RAID 0, with the security of RAID 1. There are other RAID configurations, but those are the only four that can be configured in a desktop environment. If you decide you want to take advantage of one of these configurations, the first step is to install a RAID card in your desktop. With so many possible configurations, it can be hard to understand which card will work for you. We’re going to take a look at the three best RAID cards and help you understand the ideal uses of each. Delivering cost-effective controller solutions from China, IO Crest offers unbeatable value. Their products are in widespread use, as they supply many large computer manufacturers with peripherals. 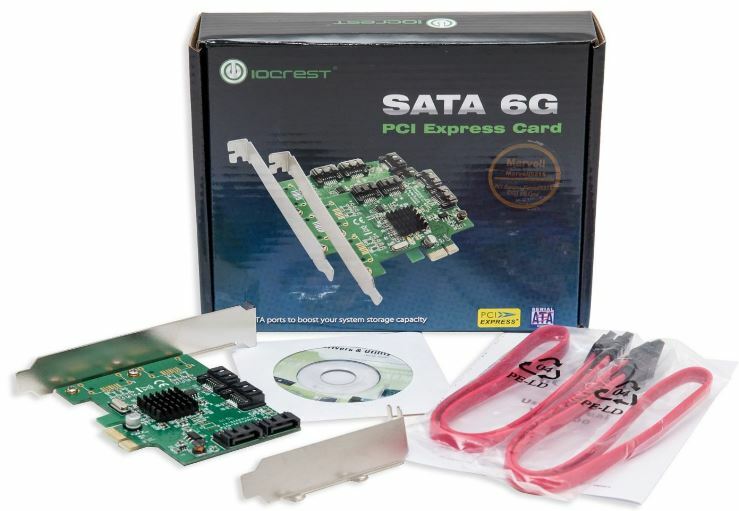 The IO Crest SATA III Controller Card is highly configurable. 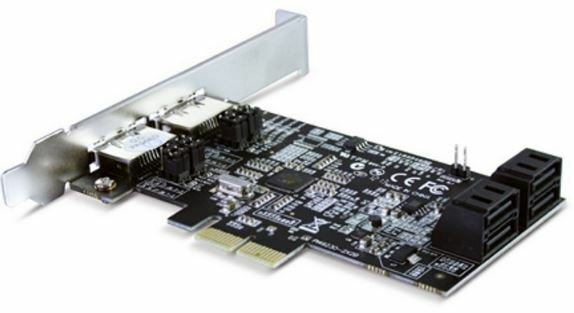 It’s based off a common controller, the Marvell 88SE9235 and supports the latest version of the SATA standards: 3.0. Like most SATA controllers, it’s also backwards compatible with older SATA devices. Additionally, it can be purchased with anywhere from two to eight SATA ports. One configuration even offers you four external ports found on the back of the card, and four more internal ports. 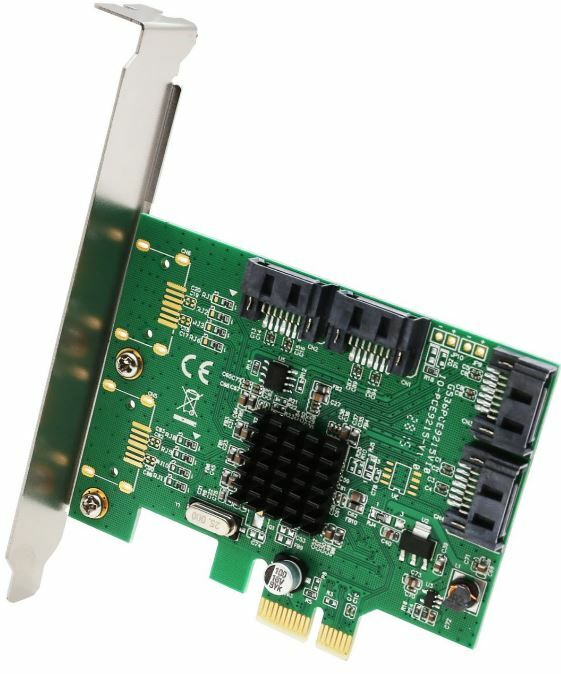 The card connects to a PCIe x2 port, but like any PCIe card will work in an x4, x8 or x16 slot. The performance of this card is high enough that you will be able to use any single drive available on the market without any reduction in its maximum potential speed. Since the latest SATA standards are supported, the drives will operate the way they were designed to. On average, the two PCIe lanes used by this card can handle around 600MB/s of transfer speed cumulatively. This bandwidth is shared between all of the active SATA ports. If you’re accessing either a single SSD or up to four hard drives at the same time, you’ll notice no degradation in performance. This is a pretty vanilla device designed for simple applications. It does, however, have one handy feature. That is the inclusion of Native Command Queue. This is an extension of the SATA protocol that allows the drives to change the order in which data is sent. If you’re sending a lot of commands to the drive or working with large files, this will make the speeds a little more efficient. Due to the seek times caused by the presence or read heads, Native Command Queue is only beneficial for hard drives. While sharing many common features with the IO Crest card, this model adds support for 3 different RAID modes. 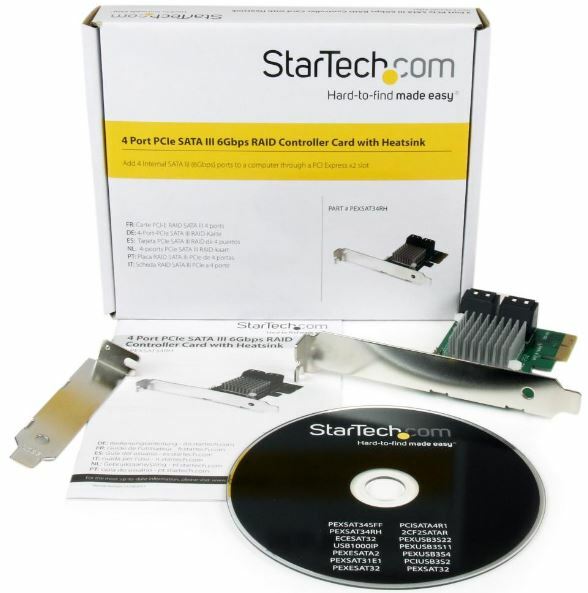 The StarTech.com 4 Port PCIe RAID Controller Card is built upon StarTech’s own chipset that takes all of the standard SATA features and adds in a few bonuses. You can select up to four SATA ports in total, with different combinations allowing for external ports. 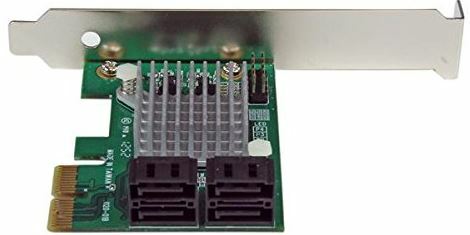 Some configurations also offer an mSata port, a common connector used for small SSDs. It supports RAID 1, 0, and 1+0. There’s another supported drive striping technology known as HyperDuo, used for combining different drives into a single volume. This card also uses the PCIe x2 standard, restricting our potential gains from RAID a little bit. Currently the fastest consumer SSDs on the market cap out at around 500MB/s peak transfer speed. Since we have around 600MB/s of total bandwidth for all drives, we should be able to take full advantage of even the fastest consumer drives on the market, provided we are only accessing one of them at a time. RAID 1 will work at full speed, and you could even create a RAID 0 array of some hard drives to improve their performance issues. But if you were planning to use multiple high end SSDs, it is possible that there may be some bottlenecking. Peak transfer speed is possible when working on large files under ideal conditions. In RAID 0, you would still seem some performance improvement over a single drive. The RAID array would compensate during the times when the drives were operating in challenging conditions. But anytime you are accessing a large files, you would not be able to exceed the PCIe bandwidth of 600MB/s even though the drives are capable of 1000MB/s. That makes this card is a great choice for users who want to use the redundancy features of RAID 1, or are willing to accept a modest improvement from RAID 0. HyperDuo is a unique feature that’s similar to RAID, with a couple small changes. RAID can only combine identical drives into one volume. HyperDuo lets you combine drives of any size. Ideally, you could take the massive storage space of a hard drive and combine it with the snappy performance of an SSD. HyperDuo will automatically find the most commonly used files and put them on the SSD, improving the overall system performance. Unfortunately, HyperDuo is not yet supported on Windows 10, so this feature is for windows 7 and 8 users only. While Vantec is a relatively unknown company, their RAID controller card is one of the most powerful solutions on the market. 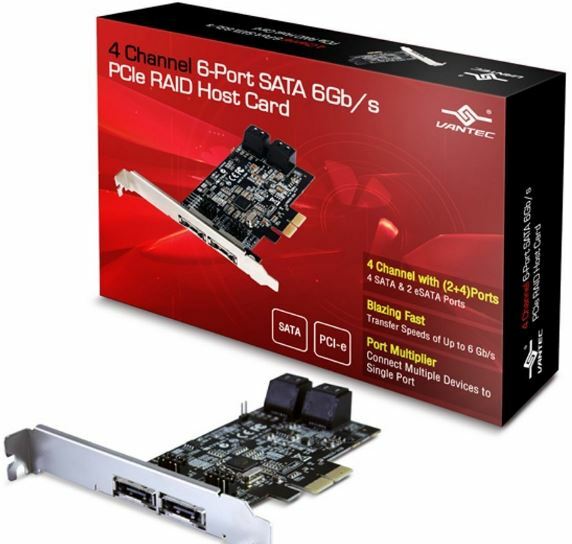 The Vantec 4-Channel SATA PCIe Raid Controller Card has ports for up to 6 SATA devices. While only four can be in use at any time, FIS switching allows ports to be activated on-the-fly. It supports both HyperDuo and the latest SATA standards. RAID modes supported are 1, 0, 1+0, and JBOD. 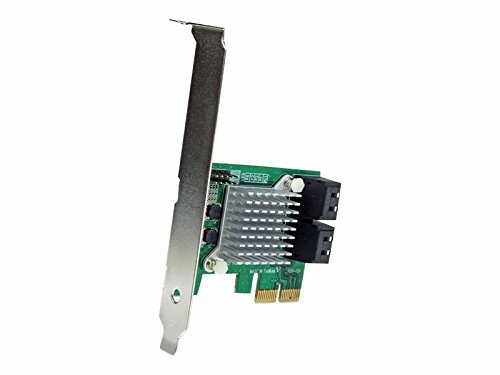 By taking advantage of four PCIe lanes this card is able to offer a total functional bandwidth of up to 1200Mb/s, which is plenty for even power users. This is where the Vantec PCIe RAID controller really shines. Now that we have access for four whole lanes of PCIe bandwidth, the benefits of advanced RAID arrays become apparent. Throwing four mid-level hard drives into a RAID 0 array could give you 3TB of SSD-like performance for under $400. Alternately, four modern SSDs in a RAID 0 array could provide near-instant response to nearly all of your computers daily tasks. Finally, RAID 10 could give you the best of both worlds through a lightening quick disk array that is immune to failure. 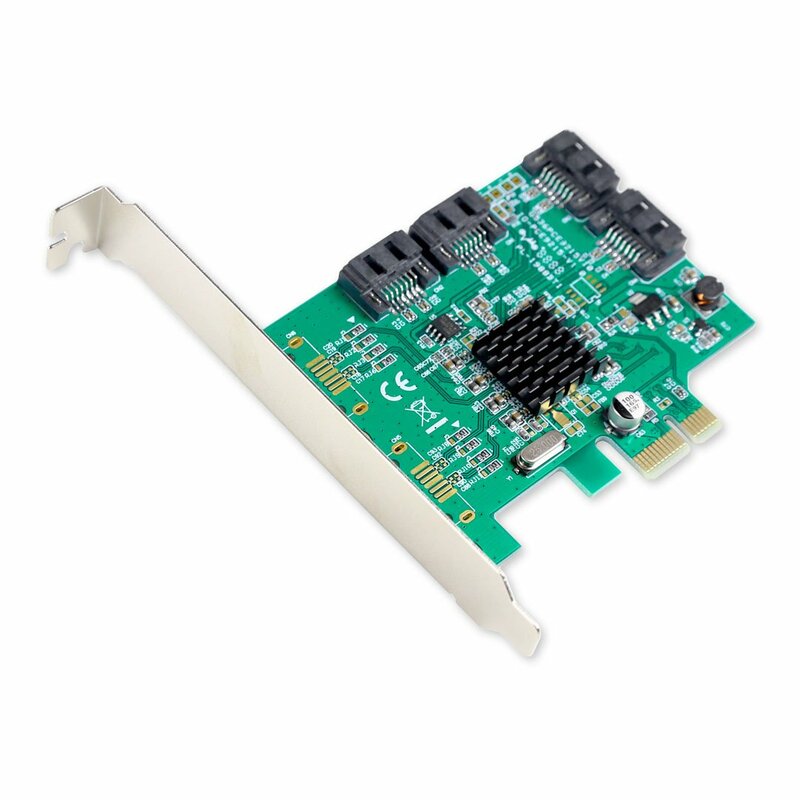 Based on the technologies that are available to us, this PCIe SATA controller card lets us take full advantage of even the newest drives on the market. No matter what combination of drives and configurations we use, the bottleneck is almost always going to be the drives, not this card. This controller has a few features that we’ve seen before. Aside from HyperDuo and RAID, there’s another striping configuration called JBOD. This acronym quite literally means Just a bunch of disks. True to its name, it allows you to take as many drives as you want and combine them into a single volume. There is no redundancy or speed improvement, but it does save you from having to move files around if one disk gets full. Next is FIS switching. This means “first in service”. This card has 6 ports for SATA drives, but can only read from 4 of them at a time. If you had all 6 ports connected, you would actually see all 6 drives from your computer. Whichever 4 drives you accessed first would automatically come online. If you wanted to access a 5th drive, however, you’d have to eject one. Although all three of these cards are great options, they each have their own specific purpose. Depending on your need for speed, redundancy or expansion one card will be better than another. To help you make a choice, we’ve prepared three different usage scenarios and made a recommendation for each. 1:You just want to add more drives to your computer, and do not plan to use any RAID features. In this case, the IO Crest Card will probably suit your needs best. It’s inexpensive, has no frills and can be customized depending on the number of ports you need. As long as you don’t need more than 500MB/s of bandwidth and will only be using one or two of the drives at the same time, this is the perfect controller card for you. 2: You want to take advantage of RAID 1 to keep your data safe from corruption or drive failure. In this case, the StarTech Card is the best solution for you. With RAID 1, there is no additional bandwidth being used by the second drive, all of the redundancy operations are handled by the controller. Since there are very few consumer drives that exceed 600MB/s, this controller will give you all the benefits of RAID 1 no matter what drive you choose. If performance is your number one goal, the Vantec Card harnesses 4 PCIe lanes that can provide an insane 1200MB/s with the right drives.